Provide comfort for the family of Margaret Helms with a meaningful gesture of sympathy. Margaret Helms went to be with her Lord & Savior, Jesus Christ on the morning of Sunday, February 10, 2019. She is predeceased by her son, Gary Trombini and she is survived by her 2 sisters, Shirley Trombini of Mauldin and Nancy Kelley of Simpsonville. Margaret Helms had one grandchild, Jessie English Trombini and 3 great grandchildren: Azera Channing English, Madeline Eva English, and John William English. Her nieces left behind are: Cynthia McLean Kushell, Gina Trombini Bay, Adrianna Trombini Alexander, and Shanna Kelley as well as one nephew: Gino Trombini, Jr.
Palmetto Mortuary in Mauldin is handling the arrangements for her Funeral Services. 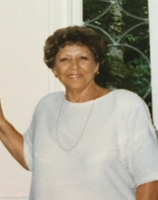 Margaret was a loving mother, grandmother, great-grandmother, sister, aunt and friend. She was a friend to anyone she met. The family will receive friends at the home of Gino & Shirley Trombini at 11 Fairlane Drive, Mauldin SC 29662 on Saturday, February 16th from 11:30-12pm. The memorial service will follow at 12pm. Please join the family during time as we celebrate her life. Please send condolences & flowers to the family at 11 Fairlane Drive, Mauldin SC 29662. To send flowers in memory of Margaret Helms, please visit our Heartfelt Sympathies Store.